My busy season is starting to wind down at work, which means I have time to take a walk during the day to get some fresh air. Soon I'll hear the buzz of chainsaws as people have their trees pruned or cut down. That's the sound of early Spring around here—music to my ears. 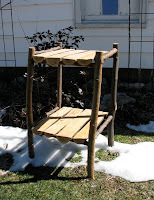 It reminds me of one of the first projects I ever built: a rustic chair. Back then, I had only a jigsaw, electric drill, one chisel, a really dull handsaw, and sandpaper. I didn't have much disposable income to buy tools or nice lumber. But I did and still do live in a neighborhood that has an abundance of trees. And neighbors who love to trim them. One day on a walk, I spied a homeowner cutting down his small locust tree. I've never been shy about anything, except for being a wee bit shy of 5' 6" tall, so I asked him if he had plans for the wood. Nope. Would it be okay if I took it home? Yep. So, what do you do with short, gnarled branches? You build a rustic piece. I had read about mortise and tenon joinery so I drilled holes with a spade bit and used the chisel to make the tenons, which I rounded with sandpaper. It took a long time, but I was so proud of the painfully uncomfortable chair I had built. Then I found more branches and made a rustic table. Try using a dull handsaw to cut limbs in half lengthwise if you ever feel like being mean to yourself. Eighteen years later I'm still using branches and logs given to me by friends. 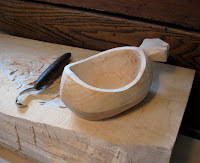 I use them to make spoons and lately, a kuksa. The difference is, now I have some really nice tools to use. So keep your eyes and ears open. Let your friends know to keep you in mind if they're planning to cut down a tree. And if you live in apple country like me, now is the time that orchards are cutting down old apple trees and are happy to give them away. You don't need a hike in the woods or the lumberyard to find suitable wood for projects. Sometimes you can find what you need right in your neighbors' backyard.